Formula One has been dominated by just two teams and a handful of drivers for the past 18 months, so we figured this was an event worth documenting. In the process, we catch up with Kubica and teammate Heidfeld along with big boss man Mario Theissen on their way back from the podium celebrations. 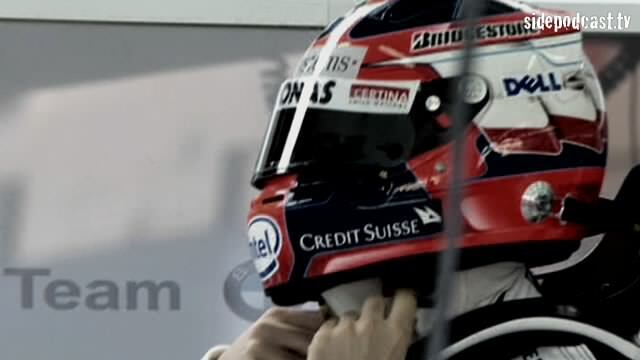 But don't you go pretending that a gutted Nick Heidfeld doesn't make you want to cry, you know he does. F1 has a new top team to mix up the status quo and we're really looking forward to the second half of the season. As Jesse Malin aptly puts it: "A new generation, and the whole world's shaking". Couldn't have put it better ourselves. Special thanks go to BMW Motorsport GmbH and ICNsport for the use of their video footage and photographs.